Last month I read an excellent article in The Times about ‘Peer pressure for grown ups’. The recognition that peer pressure is not the preserve of teenagers anymore is something all companies must be mindful of. Friend endorsement is everything. Almost every choice we make is a function of peer pressure to some degree. You want to see the movies that your friends have enjoyed; you want to read the books they loved – you want to feel part of the scene. We do it to be liked. We are hard-wired to follow the crowd to maximise our prospects of survival. People tend to do what they see other people doing. And the irony is…unsurprisingly I wanted to share this excellent article with my friends. 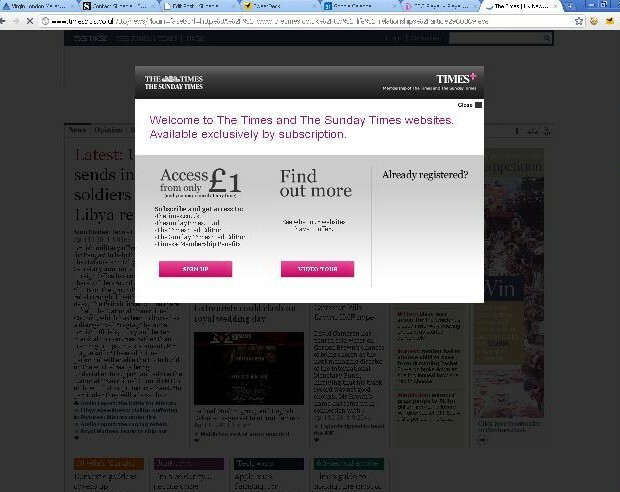 However, as it was published in The Times, the online article remains locked behind the News International pay wall. I could include the link in a Tweet or Facebook update, but I don’t imagine anyone will pay to read it. Here’s the link now. Go on, click it. What feelings cross your mind when you arrive and can’t read the item? Frustration? Anger? While a part of me would like the News International experiment to work, any news site that has a paywall must keep the social reading experience at the forefront of its strategy. The frustration of clicking a link that leads to inaccessible content will turn readers away, often leaving them with harsh feelings toward the site. Bringing new readers to the site instead, will foster loyalty and build a stronger community. The Economist has a pay wall, but allows users a limited amount of free access. Consequently social media helps the site reach subscribers, regular readers and new readers alike, with those visiting more likely to return. For more on peer pressure, have a look at Influence: Science and Practice by Robert Cialdeini. For a check on how your company can influence more effectively via social media, then please contact me.